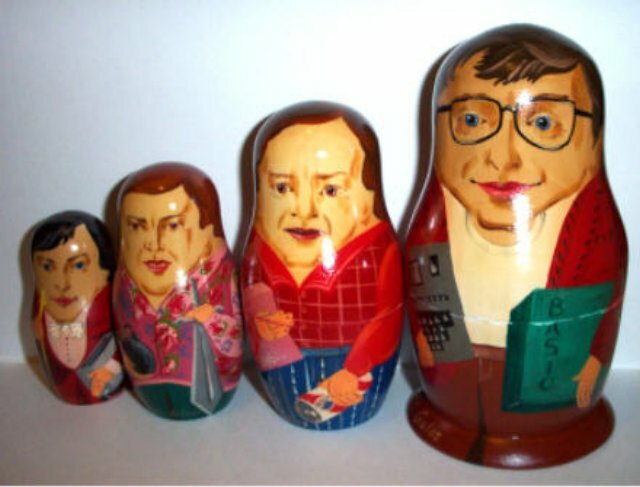 Measuring approximately 7.5" high, a four piece hand painted wood nesting doll set with Bill Gates and Computer Founders (all named) and dating to the 70s or early 80s. This unique doll was fresh to market from Seattle estate sale. This set was one of 50 commissioned by computer columnist Stewart Alsop’s company in 1991 when he held conferences called Agenda and Demo. At the time that these dolls were being made, Mikhail Gorbachev was kidnapped in an attempted coup in the former USSR, which caused delays in the shipment of the dolls, but they did arrive in time for the conference. In 1975 wrote and licensed first BASIC interpreter for M.I.T.S Altair computer 8800 and formed Microsoft with Paul Allen. While at Harvard, was visited by high school friend Paul Allen, from their computer club at Lakeside Prep in Seattle. Paul had brought a Popular Mechanics article about the “First Microcomputer Kit” by Altair. Even though they did not even own the computer, the two contacted M.I.T.S. claiming to have written a BASIC language interpreter for it, and then worked for 8 weeks to develop one on a simulated Altair. Paul Allen developed the Altair simulator on the school PDP-10 mini-computer while Bill Gates wrote the BASIC interpreter. When they ran the software on an actual Altair computer, it worked perfectly. After licensing the software to Altair, Bill dropped out of college and the team formed Microsoft. Microsoft later licensed BASIC to Apple computer’s Steve Wozniac as Applesoft BASIC. At age 14 invented a color CRT but lost the patent to Sony which had filed a similar patent two weeks earlier for what would later become Trinitron. Was president of Pepsi USA until wooed to Apple by founder Steve Jobs in 1983 when asked "Do you want to sell sugar water for the rest of your life, or do you want to change the world?" Sculley soon took over Apple Computer and forced Steve Jobs out by 1985 as they disagreed about how to run the company. In 1985, John Sculley made the “worst deal in Apple history” - in the terms of renewing the 8 year license for Applesoft BASIC with Microsoft for the soon to be obsolete Apple ][ , Sculley granted Microsoft a perpetual license to use the Macintosh style user interface - this lead to the creation of Microsoft Windows. Steve Jobs rejoined Apple in 1986 and later the board forced John Sculley to resign in 1992.